Walk 171 was not recorded. Walk 176 was not recorded. Walk 179 was not recorded. Walk 181 was not recorded. Walks 184 - 186 were not recorded. 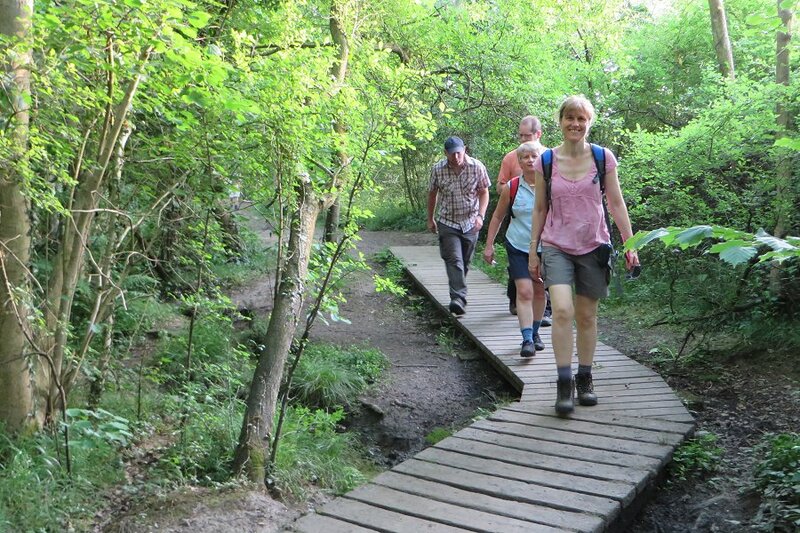 Walking through The Coombes near Arborfield and Barkham. 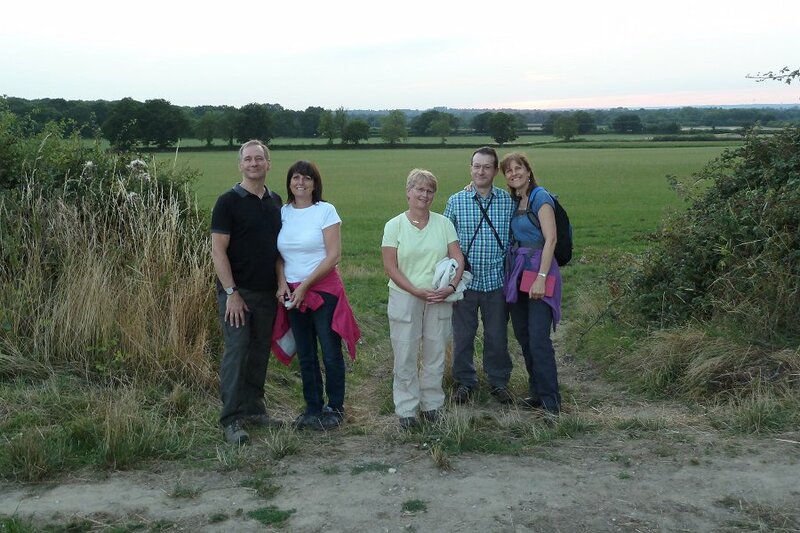 Seven of us turned up at Arborfield Cross on a very hot Wednesday evening in July. Temperatures had exceeded 32°C that afternoon and were still at 29°C at 7pm when we started the walk. Luckily the first half of the walk was through woodland, which kept us out of the scorching rays for a while. Julia, the leader, had thoughtfully brought along some insect repellent, which we smeared over our arms and legs before setting off. The previous week, when we were pre-walking the route, I got bitten by something that caused my hand to swell to an uncomfortably large size and it took a week to return to normal. Nobody got bitten this time. Emerging from The Coombes into the strong evening sunlight near Bearwood Golf Course. We headed out from Arborfield Cross along Cole Lane up to Ellis's Hill Farm where we turned off and headed into woodland of The Coombes. Following a roughly circular route through the mixed woodland, we finally emerging back into the strong evening sunlight by Bearwood Golf Course. From here we headed north-west along a track to Carter's Hill Farm, where our track joined a lane which then crossed a stream at a ford. (There was a pedestrian bridge by the ford.) We continued south-west along the lane, passing a research centre belonging to Reading University on our way to Arborfield Park. Exploring the remains of an old Church near Arborfield. 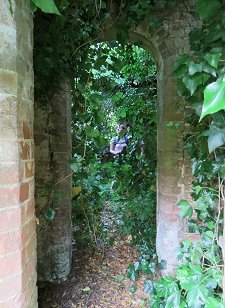 We stopped to explore the remains of the Church of St Bartholomew on the corner of Arborfield park. Now in ruins, this church was in use until 1863 when it was replaced by the newer church in Arborfield. Now it is home to trees and ivy. Skirting Arborfield, we joined the Shinfield Road and followed it for a short way before taking a footpath by Pudding Lane garden centre. This brought us out by the recreation ground on Swallowfield Road, not far from where we had started the walk. See our route on Bing Maps. It was now 9pm and the temperature was still 26°C. I had drunk a whole bottle of water on this 5½ mile walk and was still a bit thirsty so the pub seemed like a good option. Most of the group thought the same thing so we finished the evening with a drink in the pleasant garden of the Bull Inn. Another new use for old phone boxes. 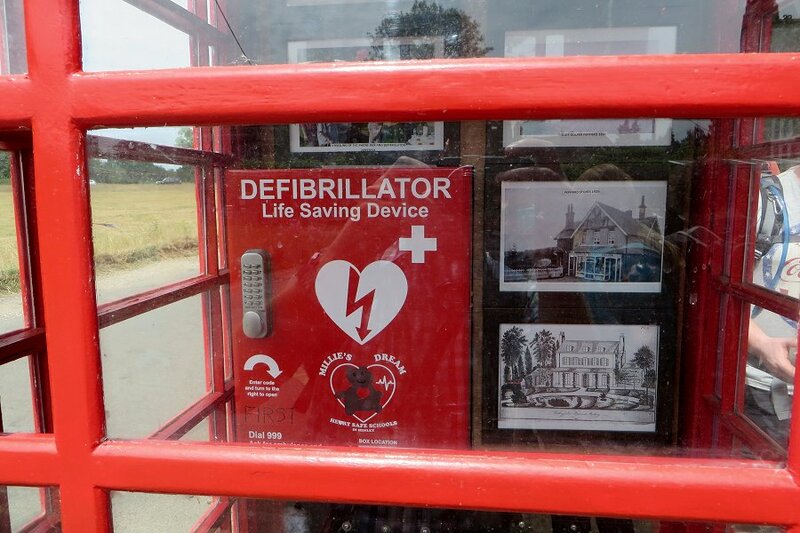 This defibrillator box was on Peppard Common. On the 5th July, seventeen of us set out from Gallowstree Common for this undulating walk, which took in the attractive fields, woodland, and lanes around Sonning Common. We began by looping round through the northern part of New Copse and across fields that were buzzing with butterflies and other insects. 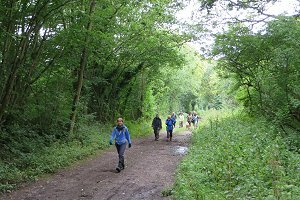 After walking across Kingswood common we then made our way through Greatbottom Wood and Littlebottom Wood before reaching Peppard Common. 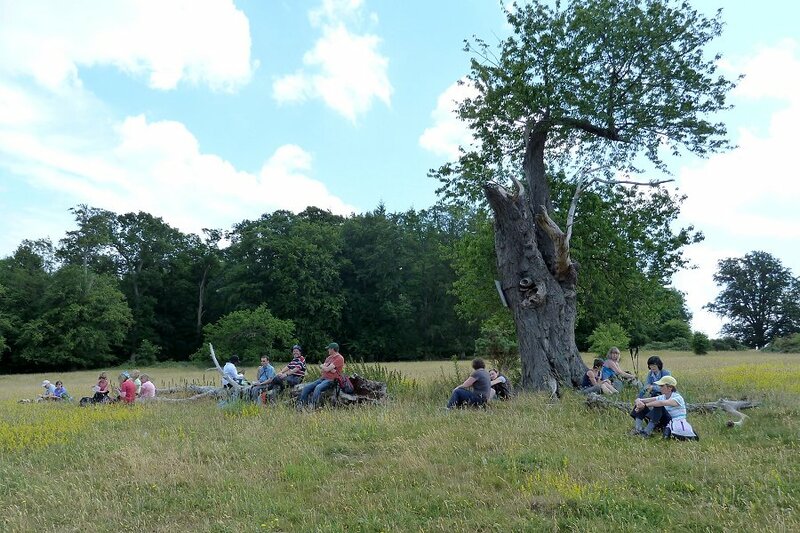 Picnic at Crowsley Park - with a convenient log to use as a bench. Here we linked up with a latecomer on the walk before passing through the village and up through Crowsley Park Woods, picking up part of the Chiltern Way along Kings Farm Lane with its striking black and white striped old cottage. 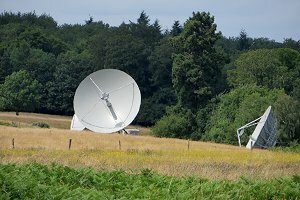 We then headed up to Crowsley Park itself; a 160 acre park owned by the BBC and site of a signals receiving station that includes some huge satellite dishes. Here we stopped for a peaceful lunch relaxing on some convenient logs and some sat under the shade of a tree. A cluster of parabolic antenna at Crowsley Park listening station. We then continued on past Crowsley Park House an 18th Century mansion house, used as a private residence. Walking through some lanes with attractive cottages and across more fields we reached the Bird in Hand pub where we sat outside in the sunshine for a drink. Thanks go to Julia for leading the walk and for providing this write-up. Ufton Green - looking rather brown this summer. 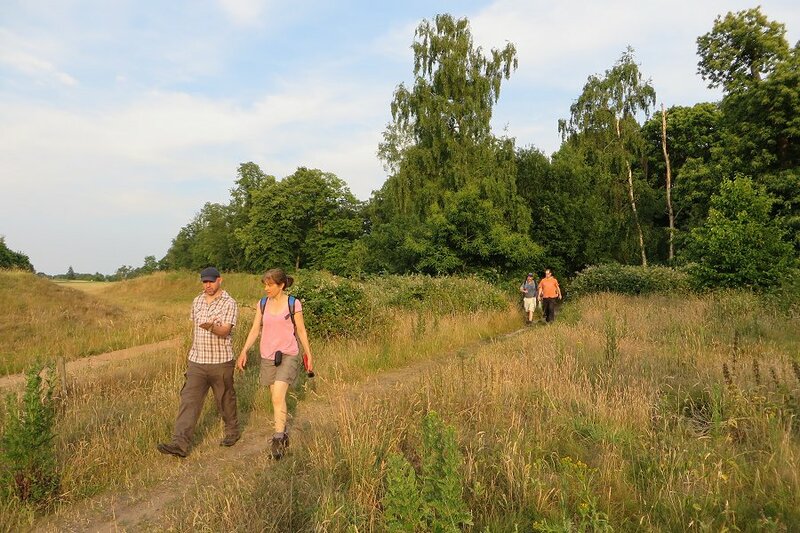 Yet another sunny evening on Thursday 9th July saw a group of us meeting up after work to make the most of the long daylight hours with a walk around Ufton Green and Padworth Mill. The party consisted of a mix of Berkshire Weekend Walkers and friends from the Berkshire Walkers 20s & 30s group. Brett, a young man from the BWs who is partially sighted joined us, accompanied by his guide dog. 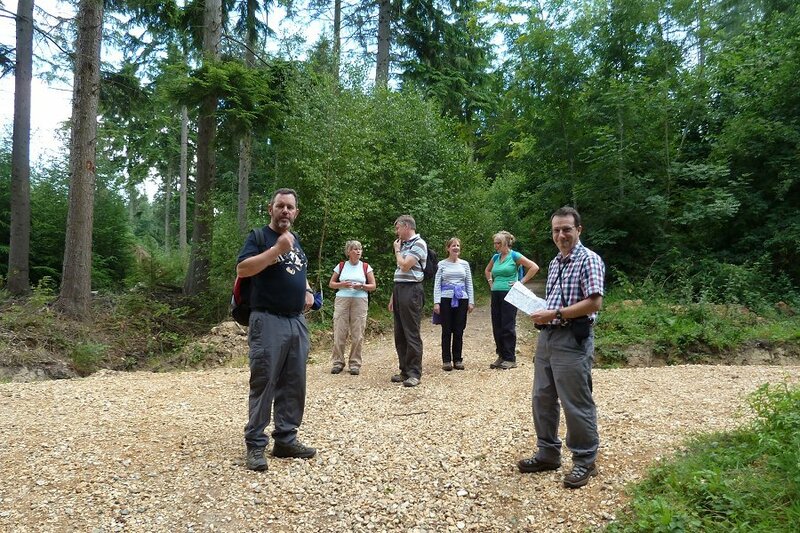 Dan, another of the BWs, gave assistance when required by describing the terrain ahead. Setting off from the car park by Tylemill Lock in the direction of nearby Sulhamstead, but turning off through Cox's Wood and emerging onto Ufton Green - looking more brown that green due to the long dry spell we've been enjoying recently. 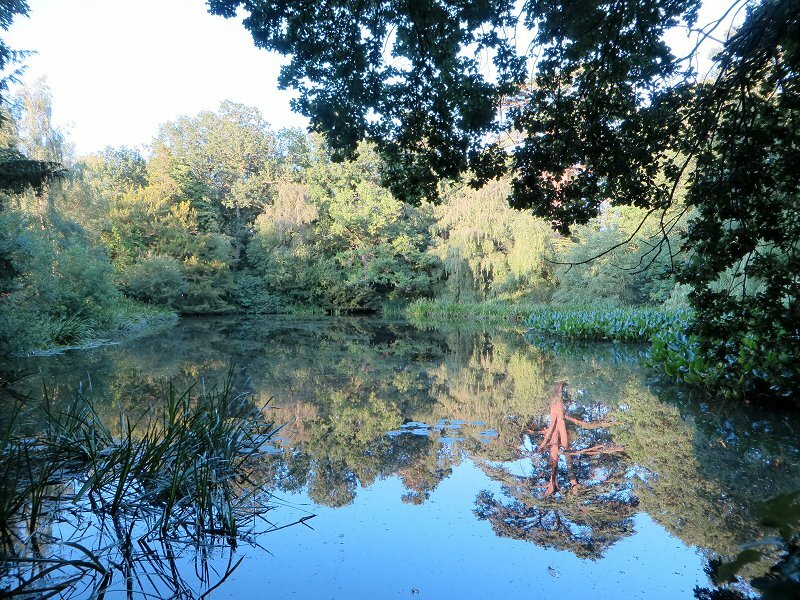 Reflections in a pond by Padworth College. We continued following a south-west route through fields and woods until we reached Lodge Farm where we turned more-or-less south to Padworth College. Skirting the college, we joined one of the many Berkshire Circular Routes, which took us north-west to Padworth Mill. Crossing the weirs at Padworth Mill, we continued heading north-west to Aldermaston Wharf where we joined the Kennet and Avon Canal. This we followed for a couple of miles, back to the car park at Tylemill Lock, crossing from one side of the canal to the other at Ufton Lock. See our route on Bing Maps. It was still light after our six mile walk so some of us finished the evening with a drink in the beer garden of the nearby Spring Inn. Six of us turned up at Longhill Park recreation ground, near Bracknell, on a wet Tuesday evening (despite the forecast predicting dry but overcast weather) for a five mile walk. 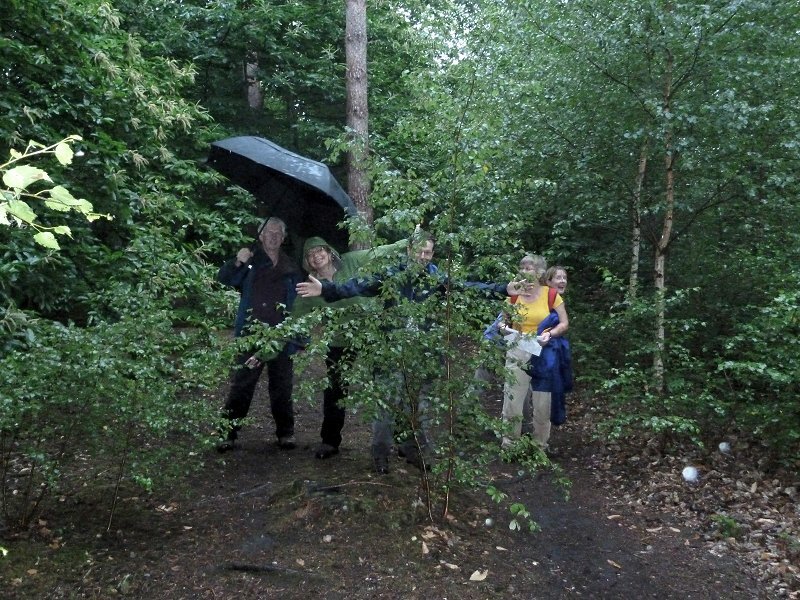 Singing in the Rain, in Bracknell Forest near Englemere Pond. Unperturbed by the rain, we set off across the recreation ground and then cut through a housing estate to the grounds of Lily Hill House. Crossing the busy A329, we followed a lane down the the railway line, which we then followed past Martin's Heron station and out into Swinley Forest. Along the way we met a group of Ramblers going the other way. They chatted about having done the same walk as us and thought it to be a very pleasant route. 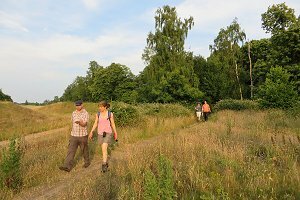 We joined up with the Three Castles Path in Swinley Park and followed it for a while before leaving to walk alongside Swinley Road up to the railway bridge. Here we re-joined the Three Castles Path and followed it as far as Englemere Pond, which was barely visible through the summer undergrowth. Leaving the forest we followed the A329, past what would have been our pub-stop had it not closed down, before heading through some more woodland back to the Longhill Park car park. See our route on Bing Maps. Ian leading his slightly mysterious walk near Hoe Benham. 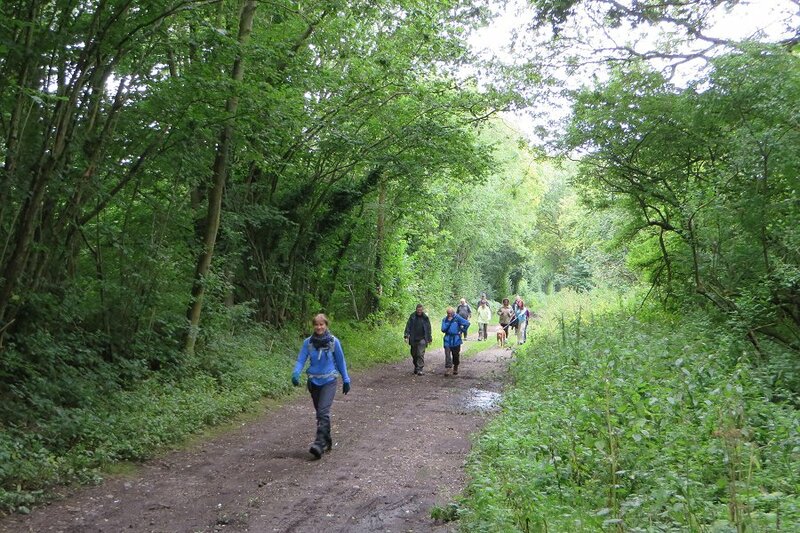 We weren't quite sure what to expect from a walk labelled in the programme as Ian's slightly mysterious walk, so ten of us gathered at Kintbury railway station to find out what this was about. Ian told us that the mystery was something to do with a place name and then set off heading north up Station Road. We turned off the road onto a footpath through a field of two horses; one foal and one pregnant looking mare. Crossing some other fields, we emerged onto the A4 Bath Road, which we eventually crossed and then took a lane north to Elcot Farm. From here we took a bridleway and then a footpath that crossed the B4000 into the Sole Plantation and Sole Common. Exactly halfway round the walk we came across this sign. The route turned back on itself, crossing the B4000 again and heading into the hamlet of Hoe Benham. Turning off onto a footpath heading toward Elcot Farm, we stopped off for our picnic lunch at a convenient grassy area. After lunch we set off southward, back down to the A4 Bath Road again. It was as we passed through Halfway Farm that I began to wonder if we were halfway through the walk yet, and if so, was this the answer to Ian's puzzle? It was! 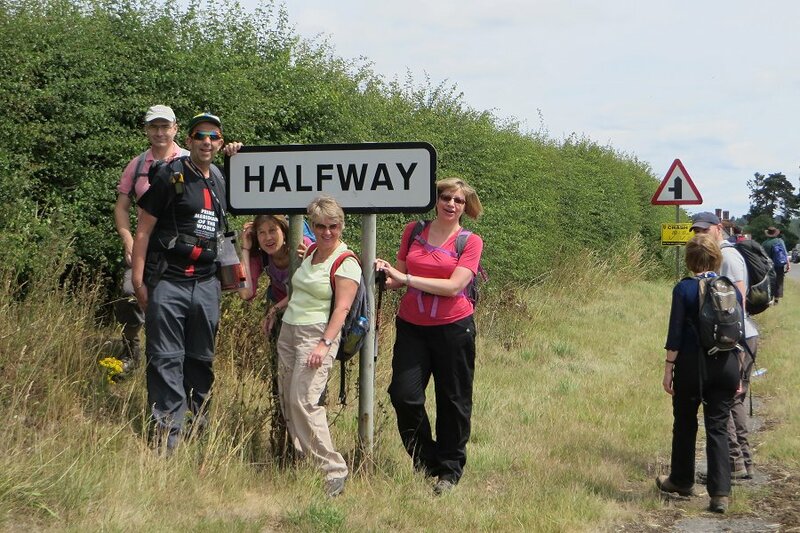 As we reached the hamlet of Halfway on the A4, we had reached the exact halfway point of the walk. We stopped for a drink at The Halfway Inn, which claimed to be 60 miles from London and 60 miles from Bristol. Not a sight you see much these days. A horse drawn barge. After slaking our thirst, we left the pub and headed north again, back to Hoe Benham, then east and south, crossing the A4 near Furze Hill. Continuing south along Milkhouse Road, through Marsh Benham, over the railway, we joined the Kennet and Avon Canal at Hamstead Lock. 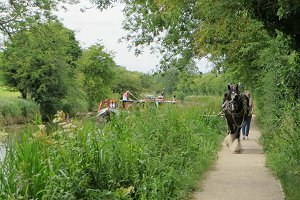 We followed the canal back to Kintbury, but along the way we came across a barge being towed by a shire horse in the traditional way. We made way for the massive horse and the lad who was leading it along the towpath toward us. The barge glided quietly along the canal without the diesel accompaniment we are used to these days. After a couple of miles we were back at Kintbury, where we had started. See our route on Bing Maps. It had been a long walk in warm weather, so we made a second pub stop at The Dundas Arms before going home. Stopping at a footpath-crossroads in Starvale Woods. Wednesday 22nd July turned out to be an unexpectedly clear and sunny evening with some dramatic clouds but minus the rain that had been forecast. Seven of us came for the walk and we set off from Mortimer Common, passed the Mortimer Fairground and soon picked up one of the Berkshire Circular Routes. This took us through Starvale Woods towards Wokefield Common where we paused by a pond that was filled with Bulrushes before continuing through fern filled woodland and past Pullen's Pond. Emerging from the woods we then walked across golden wheat fields and passed an ancient oak tree in the middle. Walking through a field of stubble near Mann's Farm. We carried on through yet more wheat fields as far as the eye could see with the trees casting incredibly long shadows in the late evening sunlight. 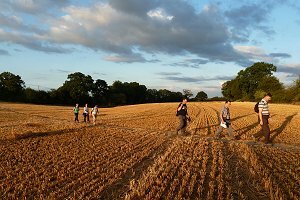 We then reached the swirling remains of a barley field - now reduced to neat rows of stubble - casting our own long shadows along the way. Finally we passed through a last patch of woodland before heading back towards Mortimer Common where we had started. See our route on Bing Maps. Some of us stopped for a quick post walk drink before heading our separate ways. Thank you to Julia for this write-up and the photos. 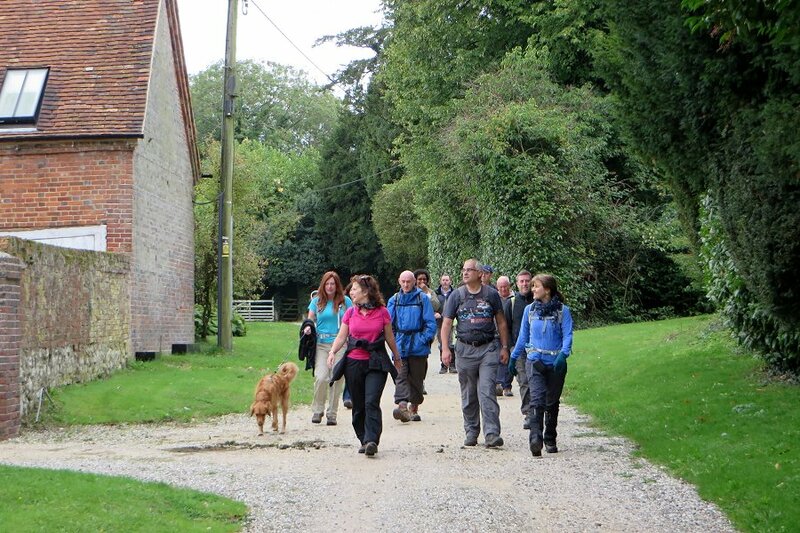 On Saturday 25thJuly, Lexi and Corinne led their first walk for us. Lexi has written up the occasion in her own inimitable style and also provided the photos. Firstly, I would like to thank my co-pilot Corinne armed with a beautifully highlighted map, I would like to thank 8 further fellow walkers who came to support us on our first walk, I'd like to thank Mike for his support (via text from afar), I would like to thank Corinne's children who helped us find the lunch stop, I'd like to thank my Mum... Sorry! Getting carried away - it's like the Oscars!!! Miniature Ponies in a field near Warfield Church. Feeling slightly anxious, we headed off towards Warfield Church, down the public footpath, over a little stream and eventually turning through a kissing gate onto St Katherine's Drive. With the church in front of us, we went left into Church Lane, past the vicarage (more tea vicar!) and right through another kissing gate into a field of little ponies. (Ahhhh) Heading in a diagonal, we crossed three little fields, passing cows and a bull (a large bull!) to the bottom left corner where we crossed a bridge over a little stream and followed another footpath (that had recently been cut back, to my relief) and eventually we popped out on Wane Bridge road. Here we turned left and then right onto another public footpath. Studious map-reading by one half of the leadership duo. After crossing further fields with horses to our left, we eventually popped out near the village of Brockhill, to join another public footpath. We had to walk past two little houses on our right, and thereafter we turned right to continue our walk. We passed fields, we crossed the A330 into Garston Lane and when we reached Old Whitelocks farm we headed off to our left and 250m we came to Hog Oak lane and headed down to the nature reserve. We stopped here for a breather and a quick drink and chocolate biscuit... It was going to be our lunch stop but we had walked at quite a pace and were ahead of schedule... Everyone was happy to enjoy the scenery before heading off again. So after a little map flapping and the support of the group, we turned around and headed back off the way we came. It's a good job Ashmore Lane is so beautiful - we got to see it twice! We had to do a large detour to try and get back on track and this added approximately thirty minutes to our walk. There was unfortunately a certain amount of road marching, a definite Roman road, but everyone took this in their stride and with good humour. Taking our picnic lunch, after our detour. Luckily we were able to trot onto a bridal way that had recently been heavily barked. It was like walking on bouncy cork... (we all had a bit of a leg work-out!!) and at the top of this lane we had our lunch stop and a welcome break. Now normally I get food envy as everyone unpacks there lunch, but today there was too much speculation over lunch as to why our route had been blocked... It wasn't the greatest spot, but we are ramblers and can cop a squat anywhere! The weather had so far been good to us, but just as we set off again, we had a little shower. It was a bit off a tease. By the time we all got our coats on the rain had stopped!! Back on track, we crossed over A330 onto Hawthorndale bridleway, followed the lane to the bottom, picking up pace as the New Leathern Bottle was in sight and a welcome shandy was to be had. The pub informed us of the bones that had been found in the lane and why we had been diverted... who would have thought!! One last leg, we crossed the A3095 onto Pendry's Lane. Here we picked up pace and followed our last bridal lane into Buckle Lane where eventually you pop out by the Shepard's House pub. Here we thanked everyone for joining the walk and stopped for a final drink to recover from our first walk... 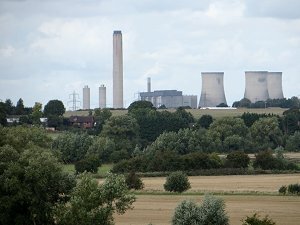 This was opposite Bowyers Lane and at the top of the lane was the car park to Frost Folly Country Park where the walk had started. Our first walk successfully delivered! Hope to see you again on another walk. Need a little time to recover from this one and not sure we can guarantee the same level of excitement next time...!! Thanks for making it memorable. Thank you to Corinne and Lexi for leading this memorable walk. The sheep were looking for any shade they could find. 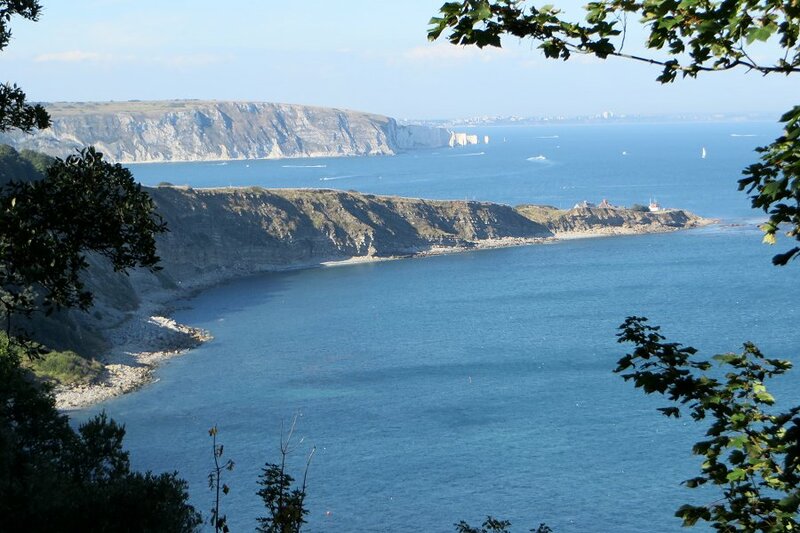 It was a glorious summer's day on Saturday 8th August in Swanage when Greg led us on a 16 mile walk from Swanage to Corfe Castle on the Purbeck Way, then cross country to Worth Matravers and back to Swanage on the South West Coastal Path. The sky was blue with next to no wind and the temperature was already around 22°C before we started the walk at 10am. 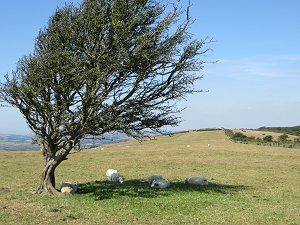 Rather disappointingly there were only three of us on this walk, which started from Swanage North Beech car park and headed off northwards by road to Ulwell, where we joined the Purbeck Way. We headed west, up a steep chalk path onto Nine Barrow Down, which gave splendid views over Swanage and the surounding countryside. Approaching Corfe Castle with more of the Purbeck ridgeway visible behind it. We were starting to feel rather hot after our ascent and we weren't the only ones. The sheep were looking for shade under the few trees on the ridgeway. Taking a slight diversion from the Purbeck Way, we stood on top of some of the barrows to gain a clear view of Poole harbour and Brownsea Island. Back on the path, we continued on to Corfe Castle and where we stopped off at a picnic area in the grounds of Corfe Castle railway station. This beautifully restored railway station runs a regular service to Swanage using steam engines during the summer months. After our picnic, we had a quick wander around the railway station and watched a steam train pull in before we continued with the walk. 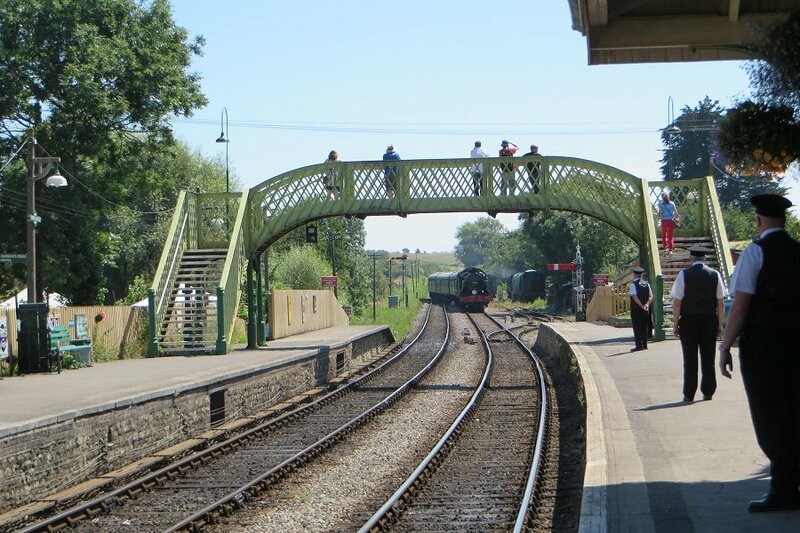 A steam train pulling in to Corfe Castle railway station. 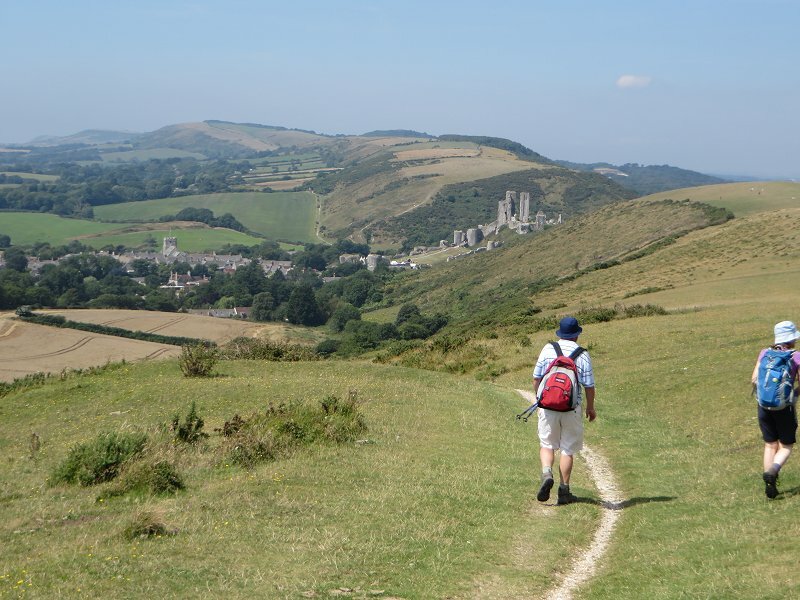 We headed south through the village and on to Corfe Common where we joined a branch of the Purbeck Way that headed south, up and down through farmland and eventually to the coast. At Swanworth Stone Quarry, we diverted from the Purbeck Way to visit the Square and Compass pub in Worth Matravers for much needed refreshments. After having a nice cool drink in the pub garden and watching the various different breeds of chicken wandering around the grounds, we refilled our water bottles and continued on our way. Following a footpath from Worth Matravers to Seacombe Cliff, we joined the South West Coast Path, heading east. Approaching Dancing Ledge on the South West Coast Path. There were more ups and downs as the path followed the Jurassic cliff edges. 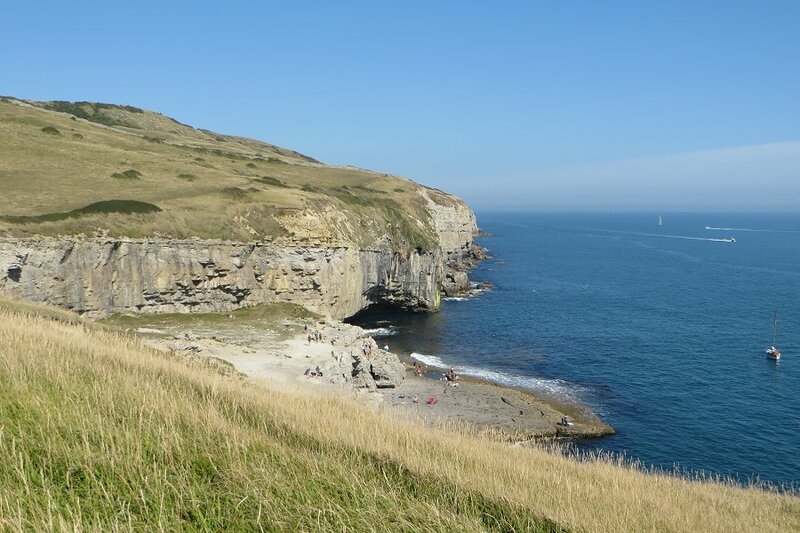 We passed Dancing Ledge, a flat area of rock at the base of a small cliff, which a number of people had scrambled down to and were enjoying the sun, sea and stones. Next passing Blackers Hole, Anvil Point and Tilly Whim Caves, we made our way to Durlston Head. The path wrapped around it and then headed north, high up above Durlston Bay. This gave good views of Bournemouth and even the Isle of Wight, as well as the nearby Peveril Point. We left the coastal path before reaching Peveril Point and headed straight into Swanage by road, reaching the sea front at about 4:30pm. Peveril Point with Old Harry Rocks behind and a bit of Bournemouth behind that. Arriving in a crowded Swanage, filled with holiday makers enjoying the surprisingly good weather, we decided to join in by getting some ice creams and sitting on the beach. During this sixteen mile walk we had walked up a total of 900m (2900ft) of ascents, and our legs knew it. Nonetheless, it was worth all the ups and downs for the spectacular views we'd enjoyed. See our route on Bing Maps. It was a warm but cloudy Wednesday evening in August when six of us (including two newcomers) gathered outside the Bull Inn in Arborfield Cross for what might be the last of this year's evening walks. Yes, sunset times have already receded to 8:30pm in the eight weeks since the longest day. Doesn't time fly! We set off along Swallowfield Road to the footpath by recreation ground, which we followed until it emerged on to the A327 Reading Road by Pudding Lane Nursery. This normally busy main road was unusually quiet as it was closed up ahead of us while repairs were being carried out to the bridge over the River Loddon near Shinfield. Turning off the A327 onto a side road, we found the entrance to Pound Copse and the footpath through it. This then led us through numerous fields belonging to Kenney's Farm, White's Farm and Tanner's Farm. 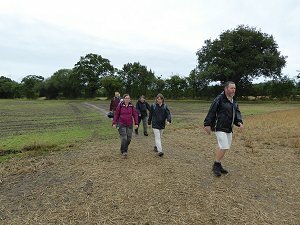 A short stretch of road walking was required before we entered Great Copse and New Plantation, by Farley Hill. Here we found the only noticeable incline on this otherwise flat walk. 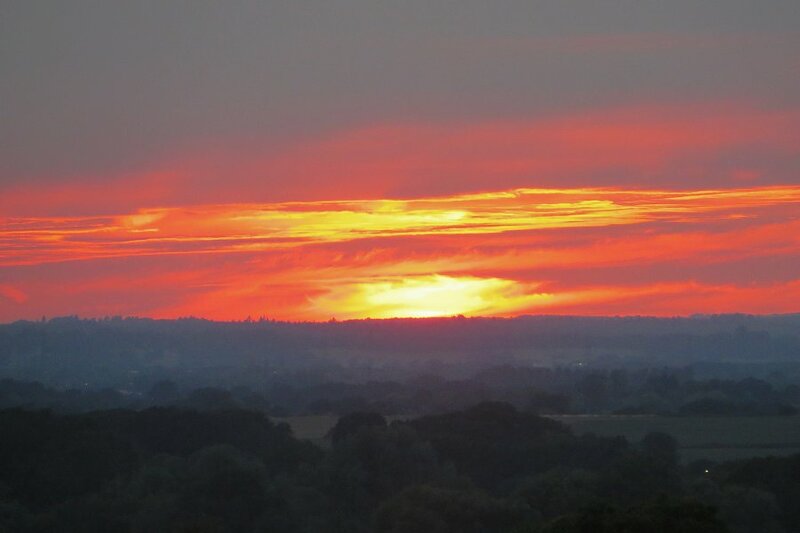 Sunset over Shinfield, as seen from Ducks Nest Farm, Arborfield Cross. This footpath eventually became a quiet lane lined with beautiful (and no doubt very expensive) cottages and houses. Turning off the lane, we entered more woodland that then opened up into a field by Ducks Nest Farm. 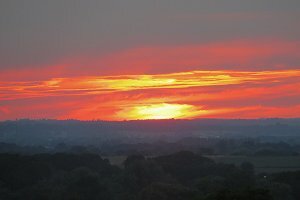 Here we stopped to admire the view to the west with the sun setting over Shinfield. Further on we passed Arborfield Court before returning to Arborfield Cross, just opposite the footpath by the recreation ground where we had started. It was a short walk back to the pub. See our route on Bing Maps. We stayed for a quick drink at the pub, sitting in the beer garden as the remaining twilight faded to darkness. The meandering Basingstoke Canal - in the rain! On 23rd August eight of us, including a couple of newcomers, gathered at 10:30am at Crookham Wharf for what we were hoping was going to be a lovely sunny 6¾ mile Sunday morning walk. The leader had chosen to put the walk into the programme during August on account of the shade provided by trees both along the Basingstoke canal and in the wooded areas during the second part of the walk. The weather forecast showed fine weather during the morning with rain arriving at 2pm, which would have been perfect as all being well we were planning on finishing the walk by then. 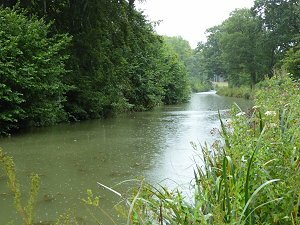 On starting the walk, we realised that the forecast had been somewhat optimistic and we noticed a light drizzle as we took our first steps along the tow path. 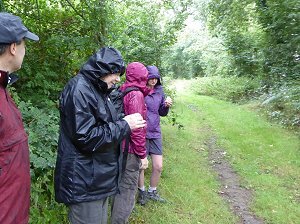 As the walk progressed, this gradually turned into heavy rain and the tree cover that had initially provided shelter became saturated and waterproofs were now essential! 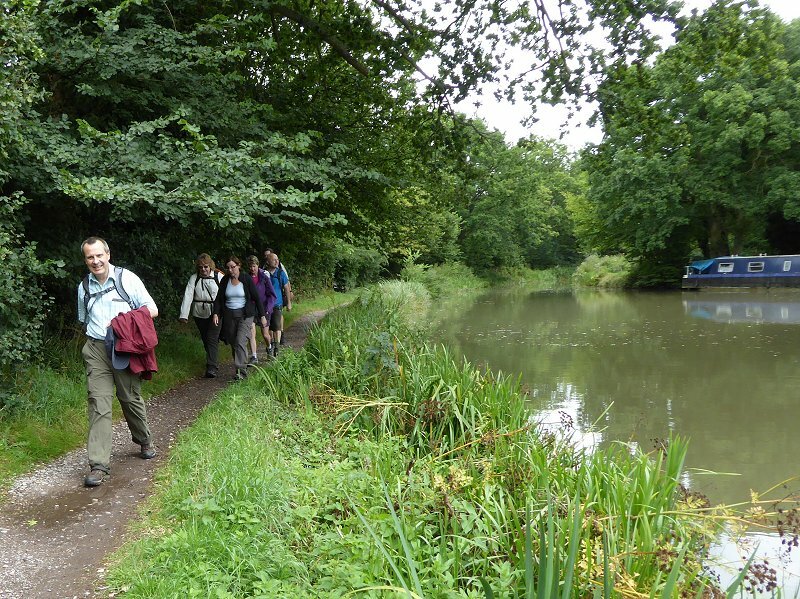 However nothing dampens the spirits of the Berkshire Weekend Walkers and we enjoyed the meandering path of this attractive stretch of the Basingstoke Canal, passing several pill boxes, Tundry Pond and some beautiful coniferous woodland. 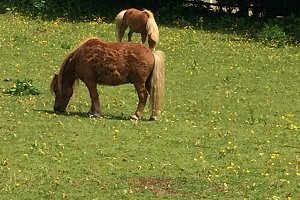 After approximately three miles and on reaching the Barley Mow pub, we left the canal, heading east across paddocks and farmland where horses and cattle were grazing. 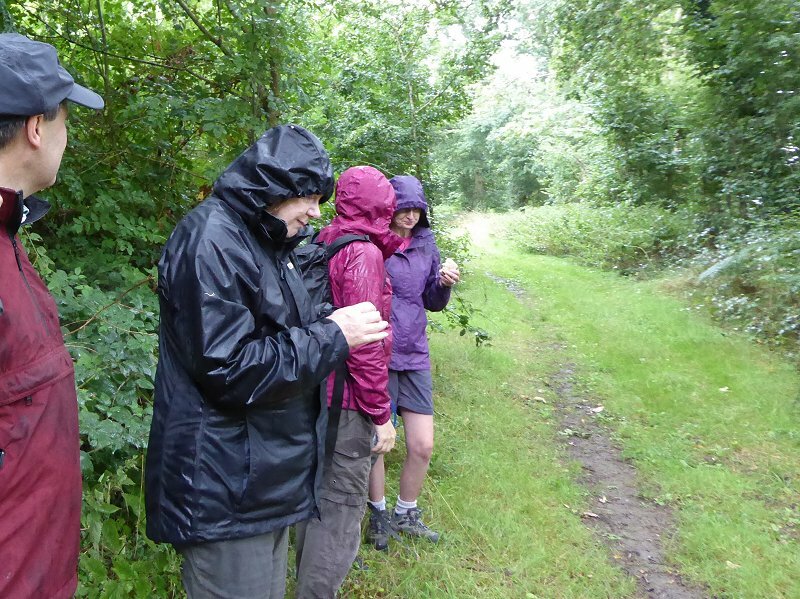 Wooded paths continued to provide a canopy to keep the worst of the rain at bay, but we struggled to find a dry location to eat our packed lunches and we were beginning to think that this might be one of the wettest ever BWW walks during August. 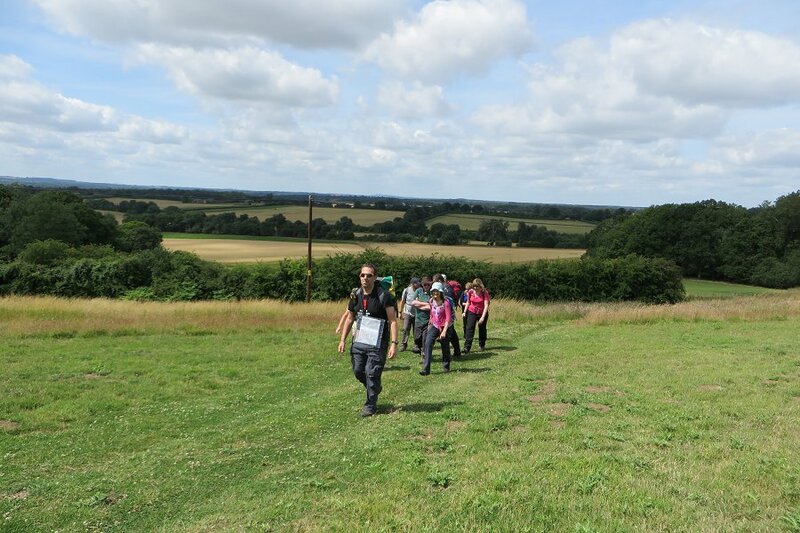 Passing Pilcot Farm, we continued east through Jack Reid's Copse and then headed south along the perimeter of a new housing estate, before crossing fields where the village of Crookham came into view. Not only was this a welcome sight as our intended pub stop at the Black Horse was also fast approaching, but within 200 metres of the pub, the rain finally abated! 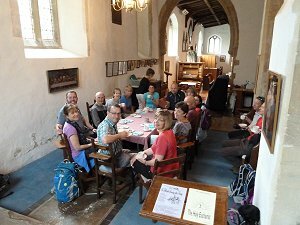 Requests for coffee and hot chocolate were the order of the day for some and thankfully the rain held off for the remainder of the walk. 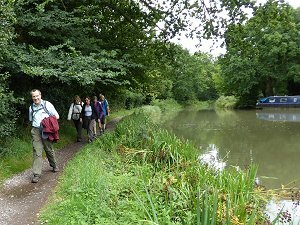 On leaving the Black Horse, the sun started to make an appearance as we continued south across fields and through woodland to join the Basingstoke Canal again at Poulter Bridge, heading west for a short stretch towards Chequers Bridge where our walk was to finish. Having stopped raining for the last mile of the route, our previously very wet clothing had now largely dried ready for a more comfortable drive home. Thank you to Sue for leading the walk, writing it up and providing the photos. 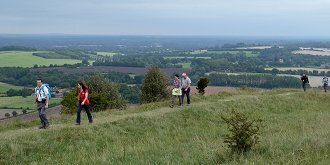 The first Saturday in September saw fourteen of us (well, thirteen people and one dog) gather at the car park on the A34 by Beacon Hill for a short easy walk around Highclere and Burghclere, with an option for a more challenging climb up Beacon Hill at the end. 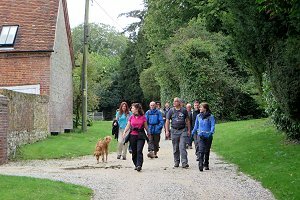 We had several newcomers on this walk, trying us out, and after a few introductions and the walk-leader's speech, we set off, crossing the A34 and heading east toward Old Burghclere. This tiny hamlet has a church and some farm buildings. It once had a railway line passing through it and even had a station. Both line and station have long gone but the bedding for the track is now a footpath. We joined this footpath heading north, toward the larger village of Burghclere. We left the dismantled railway at the bridge by Duncroft Farm, and crossing this bridge we made our way east and then north, through a mixture of fields and woodland. After a couple of miles of rural footpaths, we entered the village of Burghclere. Passing a school and a church, we made our way to the Sandham Memorial Chapel were we stopped to eat our packed lunches on some benches in the grounds of this National Trust property. We didn't go in, but I have been in the chapel before. It was built in the 1920s and its interior walls are decorated with paintings by Stanley Spencer, inspired by his experiences in the Royal Army Medical Corps during the First World War. After lunch we walked the short distance to The Carpenter's Arms pub, where we stopped for a drink before continuing the walk. 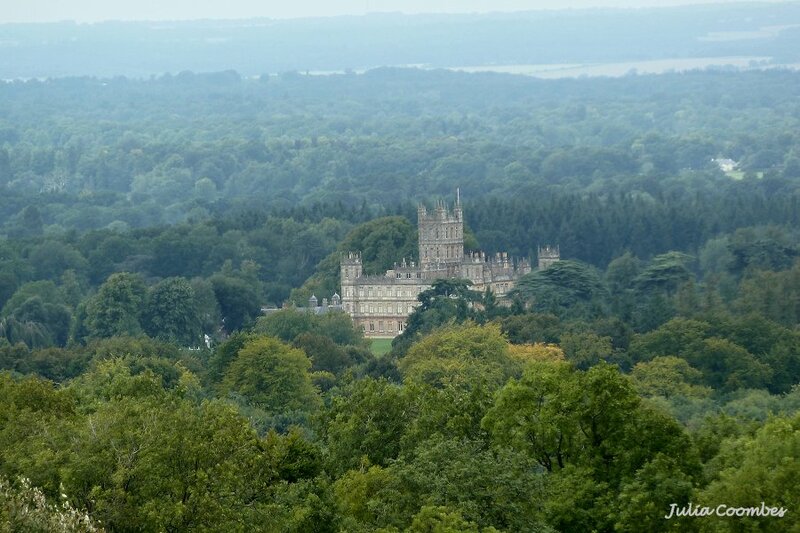 The second half of the walk was mostly through farmland and woodland, taking us back to Old Burghclere, where we retraced our steps back to the car park. For those that wanted an easy walk, this was the finish point, but about half of the group wanted to continue with the more challenging ascent of Beacon Hill. 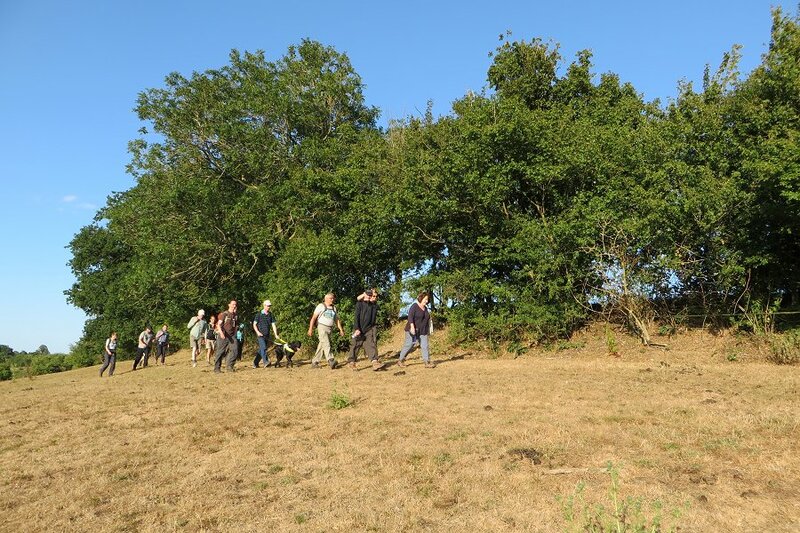 This involved a steep path though woodland followed by another steep path through open grassland before reaching the remains of the ancient hill fort, apparently dating back to 1000BC. 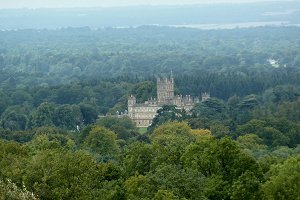 Walking along the perimeter of the hill fort, we had a good view of Highclere Castle to the north and Watership Down to the East. 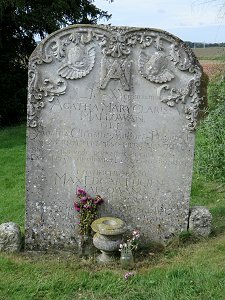 We also saw the tomb of the Fifth Earl of Carnavon, not far from the trig point on the top of the hill. He was born in Highclere Castle and, with Egyptologist Howard Carter, opened the Tomb of Tutankhamun in 1922. We returned to the car park by the same route we had come up the hill, ending this walk of two contrasting parts. See our route on Bing Maps. 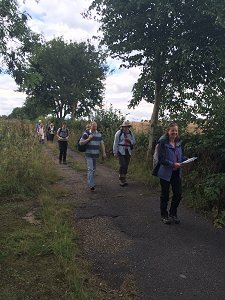 On Sunday 13th September, the day after our trip to the BBC Proms in the Park, fifteen people turned up for a 13½ mile walk around Cholsey, East Hagbourne and Blewbury. It was good to see a few recent newcomers returning to walk with us again. 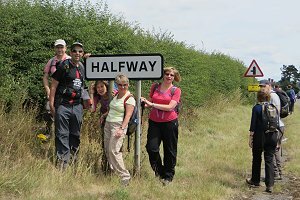 We set off from Cholsey railway station and followed a few roads and then a footpath to the Church of St Mary on the outskirts of Cholsey. Here we stopped to look at the grave of crime novelist and playwright Agatha Christie, who was buried here in 1976. We didn't look around the church as there was a service taking place. Briefly following Church Road out of the village, we then took a footpath across fields, from where we could see the ancient wooded chalk hills of Wittenham Clumps to the north. Soon we reached the village of South Moreton, which we passed through and back out into the countryside again. 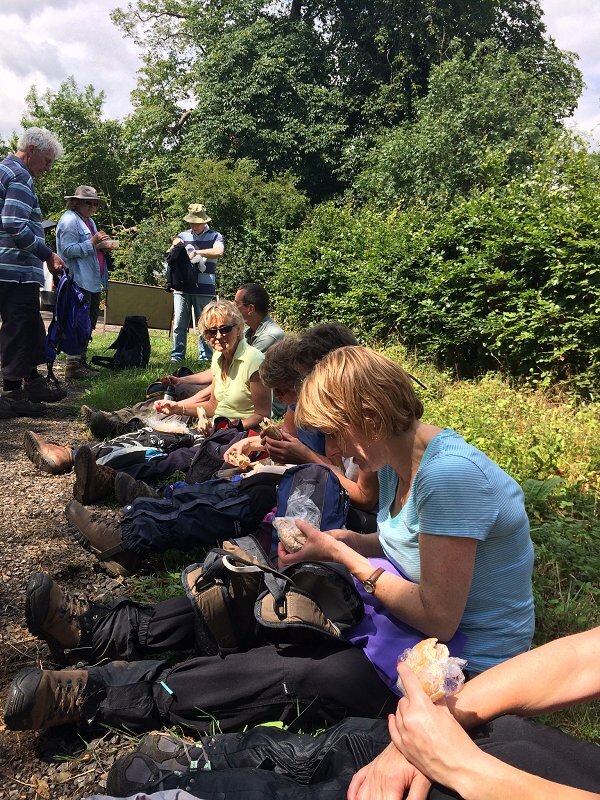 We stopped by Mill Brook to have our packed lunches before carrying on to the village of East Hagbourne, which is much prettier than it sounds, where we stopped for a drink at the Fleur de Lys pub. After our drink, we passed a number of unusual scarecrows as we left the village. We crossed more fields to West Hagbourne and then more fields to the villages of Upton and then Blewbury. Here we stopped at St Michael's Church for tea and home made cakes. These were on sale in the church to raise money for the church fund. I had a slice of an excellent Victoria sponge. Replete with tea and cake, we continued on our way, passing Blewburton Hill with its Iron Age hillfort. After a straw poll, we decided not to ascend the hill, but to carry on to the next villages of Aston Upthorpe and Aston Tirrold. 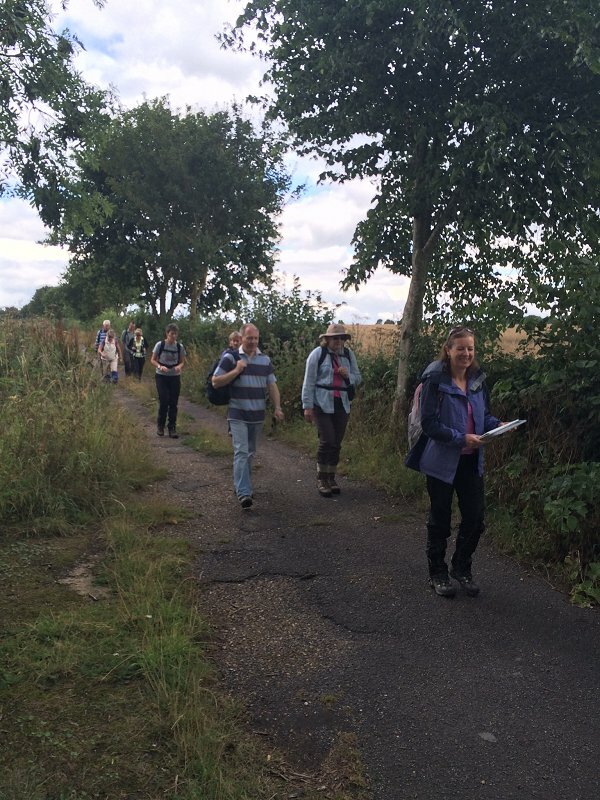 From there we crossed through more fields and farmland, finally arriving back at Cholsey. See our route on Bing Maps.